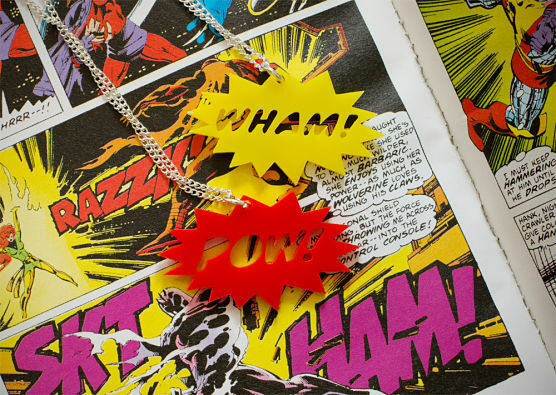 One of my favourite pop jewellery brands Finest Imaginary are heading South this weekend for the Renegade Craft Fair. If you can't make it along to their stall in London, don't worry, they have a little thrifty treat for all of us! Comic book capers now just £3 a pop! I’m a big fan of Miss Kim Lawler, fellow cat lover and creative captain of Finest Imaginary. Not only does she design her own jewellery, accessories, stationery and homewares she also crafts websites. Now that’s one sassy momma! This weekend she’ll be packing up her wares and heading to London’s Renegade Craft Fair toting her cool polar collection and kitty cat coasters amongst other things but today she revealed a super sale that got Thrift-ola Towers a little hot under our peter pan collar… Kim has decided to sell off hundreds of pieces of old stock for just £3 a pop. Ooooh-ahhhh. Designs include: Grr/arg, science beakers, flasks and cylinders, apples, zombies, cowboys, ninjas, wow/pow and monocle man necklaces. Postage is 90p. Quick, hurry and make great haste over to the FI Facebook page to snap this deal up pronto!